So two weeks after my medical to determine how ill I really am I have finally received a letter from the DWP regarding the medical. Read here for more about my dealing with Atos, despite all the negative publicity about them I can only speak based on my experience with them and my advice to anyone due to have a medical would be to ignore everything you read because it will only make you ill from stress! Go into the medical with an open mind and be 100% honest about how you feel and how your illness affects your daily life. Don’t assume anything will count for or against you just reveal everything! It is also vital that your GP is kept fully up to date of any conditions you have that you may not have mentioned to them. For example it was 4 months after my depression diagnosis that I finally revealed the extent of my IBS condition and this was vital to my medical. The good news is that I passed my medical which means that I am officially recognised as being too ill to be forced to work. The relief of this is immense because the stress of appealing, living on 0 benefits etc was making me sick with anxiety. It also provides me with vindication that I am ill and a long way from recovery and this does inspire me to one day rejoin the rat race once I am better. Strange as it seems to have passed a medical to make you unfit for work it really does make a difference to know that others can see that you are not faking anything, that its not in your head. For now it gives me some breathing space to work through my issues without the stress of being forced to look for work, and worrying about keeping a roof over my head. They even told me I am entitled to a Christmas bonus payment of £10 woot woot. So for all the negative posts out there about Atos I hope the fact that my experience was a positive one will at least cause some hope to others. Remember sometimes it is easier to write about the bad things and forget to praise the good and I found the whole Atos experience pleasantly surprising! That is not to say any future dealings will be the same but for now I have nothing bad to say about them. I am in another cycle again where I can guarantee two things will happen even though I really try to prevent them. 2. I start losing obscene amounts of money I don’t have playing bingo – and not just my money but setting up accounts in Sheryl’s name and spending her money too. The guilt today is driving me mad because she is so understanding and does everything for me and yet I cannot do the simple things like control my addictions or stay awake during the day. Last week I went to bed at 10.30 and since that night have not managed to sleep before 5 am at the earliest! I have chronic tiredness, I am physically drained and mentally exhausted. And so angry at myself for doing this again! Thank god I went shopping the other day before I thought it would be a good idea to play bingo again. Truth is Sheryl really has no idea how much I have spent playing and every time she questions her money I play dumb and I HATE myself for it. For the past few months I was so busy working on books that I was not even thinking of doing anything but writing or editing but for two weeks now I have nothing to write for my novel. I liked the projects because it was a welcome distraction and I really enjoyed doing it but now I feel like a failure because I can’t do it anymore. Just for one night could someone please take this brain out my head and find the creative one I used to use! I was sat in the office of my Dr crying my eyes out as I finally revealed the depth of my depression to someone for the first time. I had finally overcome my stubbornness and stopped pretending everything was okay. I can still remember the sense of relief when the Dr told me I had depression like it was yesterday, finally I knew there was actually something wrong with me and that it was not all in my head. I had lived in denial for so long I was convinced there was nothing really wrong me and I was simply going mad. This is why I feel so strongly about helping other men in my situation, knowing how bad I felt inspires me to make sure that it does not get to the suicide attempt stage before asking for help. Six months is not really a long time in the grand scale of things but for me it has felt like a lifetime and I am very proud of how far I have come in that time. More good days than bad, although the bad are very bad, but I am learning more each day about how to combat the symptoms and triggers of the bad days to ensure that as bad as they get they will never again tempt me onto the window again. Yet there is still a long way to go starting with my visit to the mental health hospital on Thursday for my “initial screening” as it is possible I have bipolar disorder according to my Dr following on from our last appointment. If I can continue on the current path I am on I have faith all will work itself out in the end, one way or another but without the appointment with my Dr on 28th March one thing is for sure and that is that I would not be here to help others. If I can seek help then what is stopping you? This was a message I received on Facebook last night from a “friend” of over 3 years right before she deleted me! here is the best part though – she claims to read this blog yet makes no mention of the fact that I won money playing bingo, the figure of $800 came about talking about my “dream” tattoo that I stated I could not afford because of the cost, that is not anywhere near the price of the tattoo I am getting on Saturday. This “friend”, or ex friend now, is someone who has suffered from depression so should be fully aware of the impact receiving this message would have on me so I would like to thank her for making me feel like the worst parent in the world for having the cheek to treat myself. Why do people think they have the right to make judgement on others? Mr Perfect I am not BUT I would never ever let my kids go without just so I could get something for myself. The fact is Sheryl is getting this as an early birthday present so that we can focus on saving for Christmas but should I have to justify myself and how I spend my money to people? Fine send me money through the donate button on the right and maybe THEN you can question what I spent it on but to unfriend me because you did not read what was written properly and then have the audacity to judge me is going to far! Sorry Kim but you can kiss my moose behind! Blocked and forgotten! Hopefully this rant will help improve my mood because another night has been and gone with me sitting all the way through it and not sleeping and arseholes like the one mentioned above do not help! 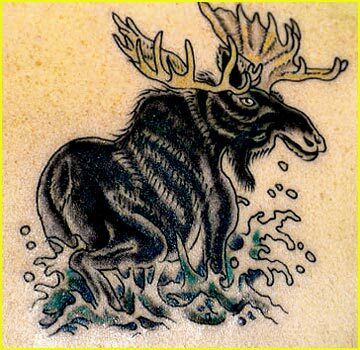 Screw the depression, the IBS, the Anxiety and everything else for the next 5 minutes because I have booked my moose tattoo and am now bouncing off the walls! Sometimes a good shout is a great release. Just rediscovered this song today on songpop! I love that game it brings up some great songs that I had forgotten! and because I’m good to you the lyrics are below so you can sing along with me.. I am not convinced I am using twitter to maximize the possible exposure to this blog so would like some tips from other folks please. I see some people spend all day tweeting all their followers with links asking for retweets is that the way to do it? or is it better to just tweet once and hope people pick up on it? Reason I ask is that I get annoyed when people tweet me their link when they have never even had a conversation with me and I would feel like a hypocrite if I started doing the same thing. Even though I do that to “celebrities” for a possible retweet but hey thats what they are on twitter for right? And don’t even get me started on people who send me a DM with their blog links as soon as I follow them. Again am I missing a trick here and should start doing the same thing?